We’ve had some remarkable meals recently that I want to bring to you. So, without any further delay, we’ll get right into it! 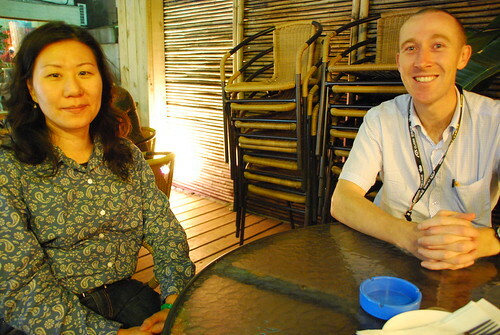 Hui-chen and I attended the Taipei Bike Show, where we met up with our friend David Reid. David suggested that we eat at the famous hamburger restaurant called Forkers. We were not disappointed! 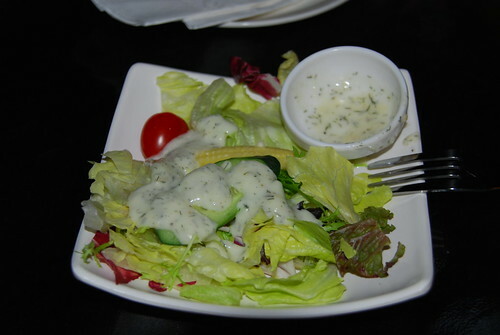 First out of the kitchen was my green salad with Ranch dressing. Just the right amount and very fresh. Next out was my old fashioned cheeseburger, featuring Kobe beef. It was worth the upgrade of NT80 for the Kobe beef. That’s dill potato salad on the right (missing a forkful). For dessert we had a peach pie. 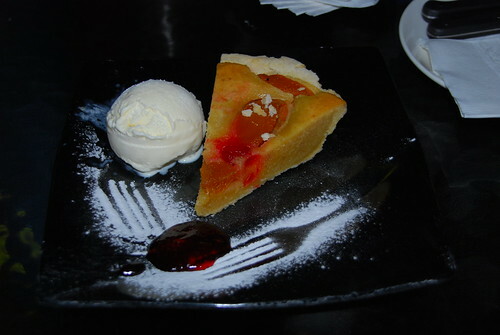 The pie itself was rather disappointing but the ice cream was fabulous as was the strawberry jam on the place. I loved the silhouetted forks done with confectioner’s sugar. 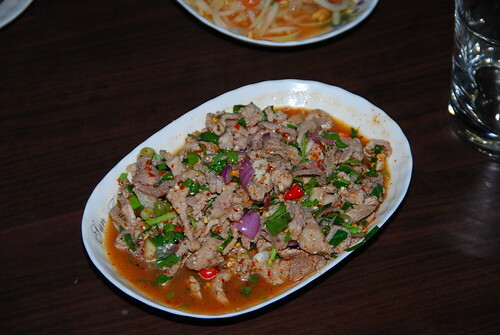 Thai meat salad. It was hot and spicy and delicious! 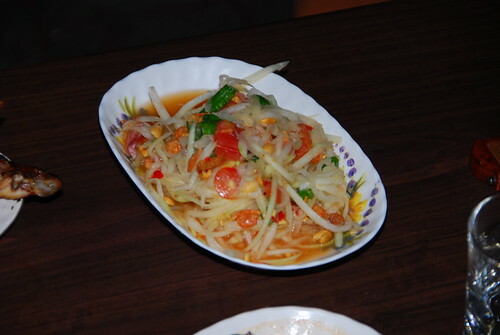 Som tam, or papya salad. Really excellent. 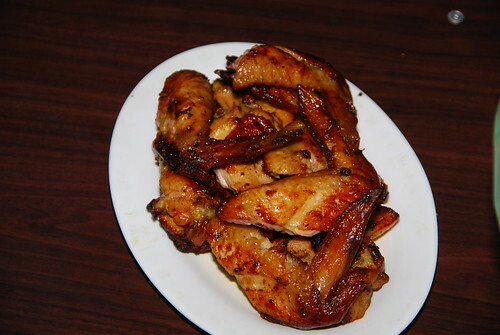 Grilled chicken. This was every bit as good at it looks. 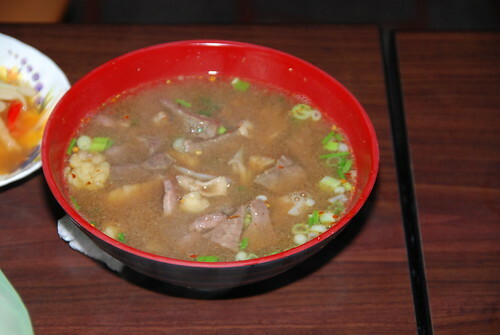 This is a delicious Thai style beef soup. Not spicy like the normal Thai fare, this was a welcome addition to the meal. 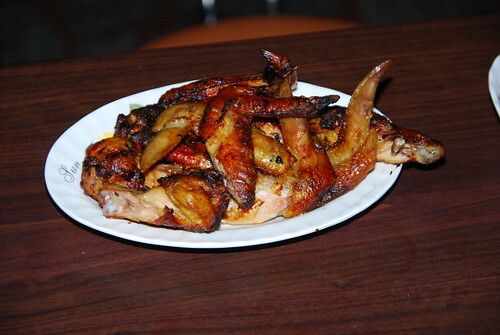 Just for good measure, I’ve included another shot of the grilled chicken. 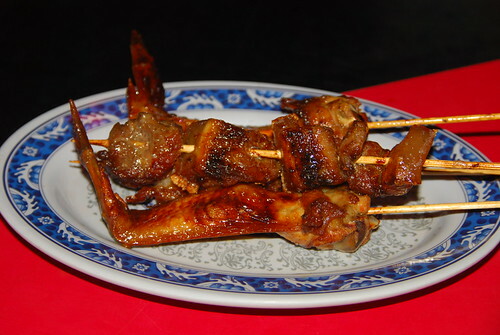 These skewered chicken wings were even better than they look here. 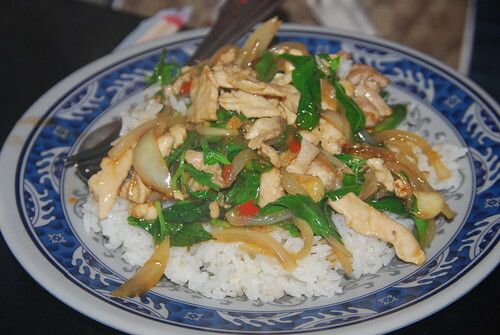 Famous “krapau” this is “aromatic spicy” (hsiang la) chicken over rice. This dish is hard to beat. 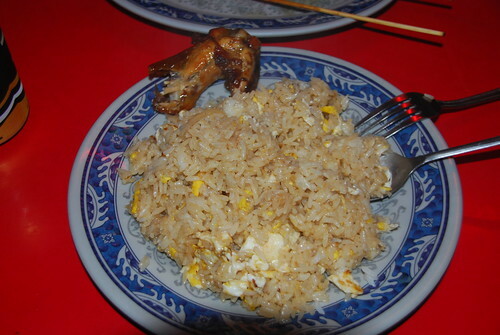 I had some plain fried rice due to some dental work I’ve had done recently (I’ll spare you the details). This shot includs a 1/2 eaten piece of chicken as well as a nice shadow cast by my long lens at the bottom of the photo. 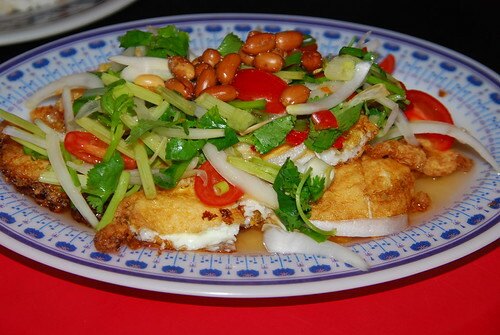 Anyone who has had A-dong’s spicy Egg Salad can tell you that it’s one of the best Thai dishes going. The combination of palm sugar, lime juice and fish sauce, along with the cilantro just gets my taste buds ready for action! 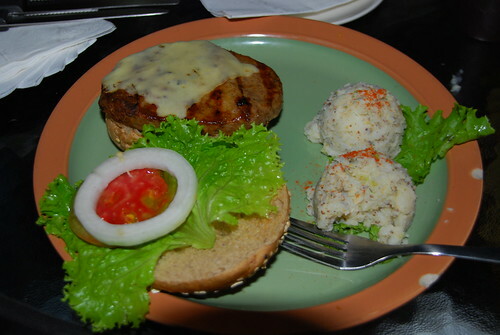 You must order this dish if you get the chance! 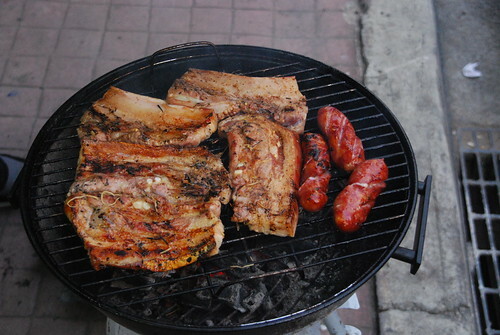 Marinaded pork and Taiwan sausage. It just doesn’t get any better than this. 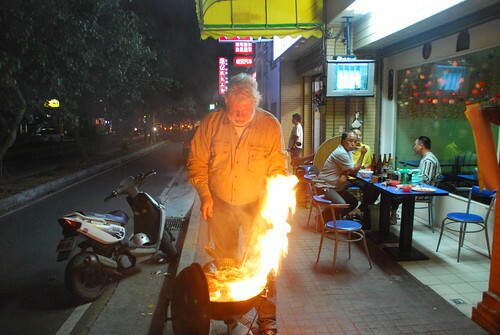 Here, I am doing my fire show by grilling vegetables. Unless you have tried them, it’s difficult to describe the grilled flavor of fresh vegetables. I guess you’ll have to join us at one of our grill parties to see for yourself! Thanks for reading. Please give us a rating, and of course, your comments! I think I’m going through Spicy Egg Salad withdrawal. I’ll have to make a trek over to Hukou with my wife after she gets back from her business trip. Todd, you should sneak up here while she’s gone and nobody will tell 😉 hehe cu soon! MJ, I am glad I have just had ‘brunch’ as some of the food looked great. Kobe beef is delicious and is now being breed in many countries under very strict guidlines. I was treated by my Japanese friend at a restaurant in Japan. He works at the Japanese Institute of Sport. I was shocked first at the price but he insisted and the beef was very good. It wasn’t until after I researched about this Kobe beef and the way the cattle are raised and looked after I understood why it was so expensive. The Thai food looked very good, I just had somtam, grilled chicken and spicy seafood salad for brunch. I am happy to see that we are both eating well. MJ, I hope you didn’t singe your hair with your flambe vegetables. Love the picture of you cooking. Bruntys last blog post..Tohsang Khong Jiam Resort, Superior and Deluxe rooms Thailand. Brunty, i didn’t realize that Kobe beef was raised in other countries as well. i’m sure the Japanese have full control of it. first time i had it was in the US and it was imported. we we are both eating well! and i didn’t singe my hair, fortunately! MJ, you made me do a little research as I had seen a show on Australian famers breeding Kobe Beef as the market demand couldn’t be met just by the Japanese market alone. One guy had converted his dairy farm into a Kobe Beef farm. The Wagyu cattle from which Kobe Beef is produced and bring the unique marbling look can be raised all over the world but should only be called Kobe Beef if slaughtered in Kobe Japan. I think when I first had Kobe Beef in Japan it worked out for a small steak, maybe 200 grams was about $100 Australian dollars. In Australia good grain feed Kobe Beef sells up to $150 a kilo. Bruntys last blog post..Laithong Hotel Buffet, Ubon Ratchathani Thailand. Brunty, oh, very good – that makes total sense. i forgot how much the Kobe beef costs that i had, but it was shaved beef for shabbu-shabbu in Boston, back in 2002. it was totally worth it. i would like to find some Kobe beef steaks here in Taiwan and grill those suckers up! love reading about food. temporary crown in a tooth? Dennis, all together, 2 years or a little more. there is only so much getting used to them that’s possible because they really interfere with eating. 2 years, looks like a fair bit of shuffling required, adult teeth also take longer to move. yea, they r like barbed wires hungry for food. Dennis, that’s a great way to put it! Oh man! You killing me! I’m trying to lose weight and shouldn’t be eating this late but now I’m really hungry! Forkers is indeed a great burger place. Especially for Sunday brunch, with their NT$80 bottomless coffee. Craig, i’ve heard about it but never went there. so now i’ve added to my list of places i would return to. Now… what is a Taiwan sausage??? When I went to the Phantom Gourmet Beer & Food Festical back in November at Suffolk Downs… the people from Firefly’s had a Chinese pork sausage which was quite good (don’t know if it was really made in China or made in the USA to be passed off as a Chinese sasuage). Geee… I can’t wait another 3 months for the next Phantom Gourmet BBQ Beach Party in June. I’m drooling just thinking about it. 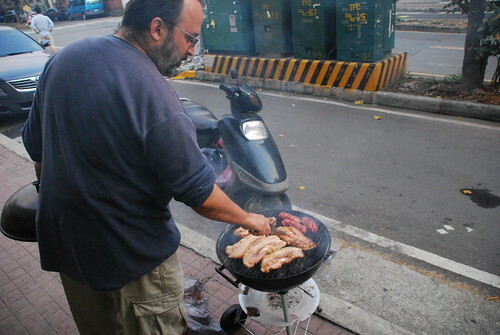 Mike, a Taiwan sausage is our version of the Chinese sausage. it’s smaller and a bit sweeter without as much fat at the Chinese version. our local stores have them. this time i want to do an article on the Phantom Gourmet BBQ Beach Party. i meant to do it last time but i got sidetracked on other projects. (of course this breaking news is only of interest to those in the New England area of the United States). Looks like the 2009 Phantom Gourmet BBQ Beach Party will be held in two different locations AND on two different weekends this year. It will be held at the MGM at Foxwoods in Ledyard, CT on June 19-21 and at Suffold Downs in East Boston, MA on June 26-28. No mention yet on who/which BBQ Teams will be at each location or if the same teams will be at both locations.